As much as I enjoy playing around with different software and apps for task management, I always seem to return to Workflowy when it comes to my own personal to-do management. Yesterday I realized that I have been using it for years at this point, and in that time have come up with a pretty substantial and reliable system for keeping my life organized. Curious about the systems that other people had made for it, I asked around and found that there’s quite a range of approaches. For the purposes of this post I’ll go over Workflowy’s strengths and weaknesses, outline my personal management system, and give some examples of ways that other people have used it. Workflowy describes itself as “a zoomable document,” and is more or less a giant bullet list that has multiple levels of nesting. Sublists are easily moved around and the list can be collapsed or expanded at any level, and items can be struck through to denote completion. It also has a tagging system, but to be honest I have not used it and stick to the basic list features. 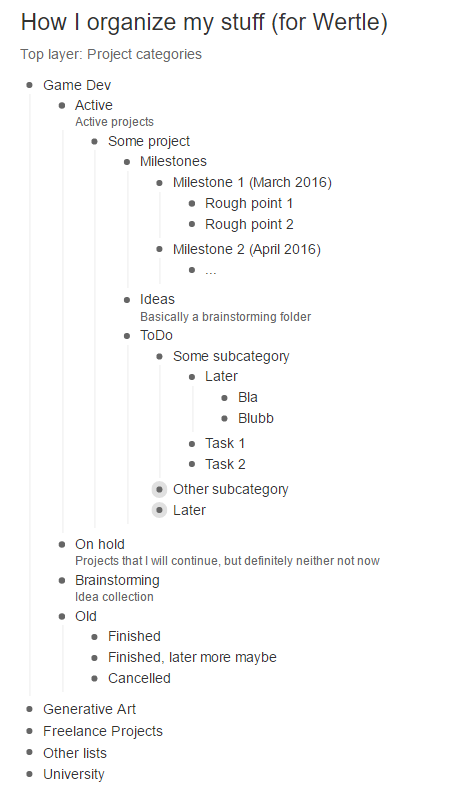 Compared to many other task-organizing systems it is remarkably simple and bare-bones, but therein lies its power. Because it is so simple, it is incredibly flexible, and easy to adapt over time as a person’s methods for tracking their own tasks may evolve. It gives you room to be messy and fluid where needed, without having to fit something into a prebuilt structure that may not make sense for the moment. I use it for both tracking actionable tasks and keeping reference (brainstorming, for example). Simplicity may be its biggest strength, but could also be considered its biggest constraint. Although you can share sublists in Workflowy, I use it primarily for my own personal organization. It can be good for recording tasks for small projects with maybe 1 or 2 other people (game jams, for example), but anything bigger than that in team size or scope is probably best managed in another tool. It’s also best at text – if you use a lot of images for your process it probably is better done elsewhere. I also don’t use Workflowy for recurring tasks or tracking time-related things, for which I rely on my calendars and a reminder system. Also for very simple lists, like what I need from the grocery, I tend to keep in physical form (I have a whiteboard in my kitchen). For organizing my personal projects and references, though, Workflowy has become an indispensable part of my life. As I dive into how I use Workflowy, note that I’ll be talking about general organization and management philosophies. My method might seem bafflingly complex, but it is the results of years of refining and evolving what happens to work for me. My intent is not to give you a how-to process to use Workflowy like I do. Rather, I want to illustrate how personalized the tool allows you to be (hence why I’ll be including examples from other folks a bit later). I will talk about both the structure I’ve come to use and the methodology in how I use it. My approach to personal task tracking is a mutated hybrid of sorts. Many bits are plucked from the Getting Things Done (GTD) system, some from The Seven Habits, and then a lot of adaptations that have just worked well for me over time. 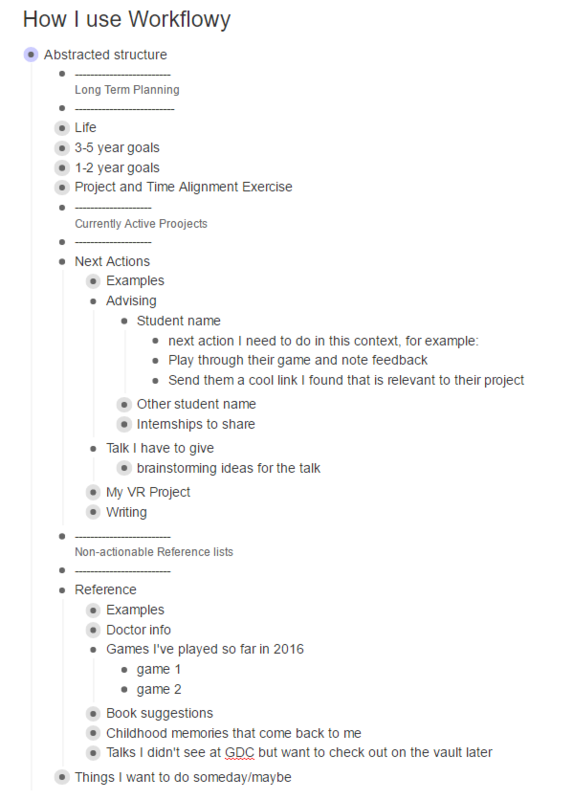 Here is an abstracted version of my list structure in Workflowy. The long-term goal planning section includes lists that I might only check once or twice a year, and maybe I won’t do any real work in there besides once every couple of years, or when I happen to go through a big life change. It is mostly there as a reminder to reevaluate what I’m doing with my life every so often, and to see if these long term goals are still relevant. The Reference area is where I keep non-actionable information that is unrelated to a currently active project. 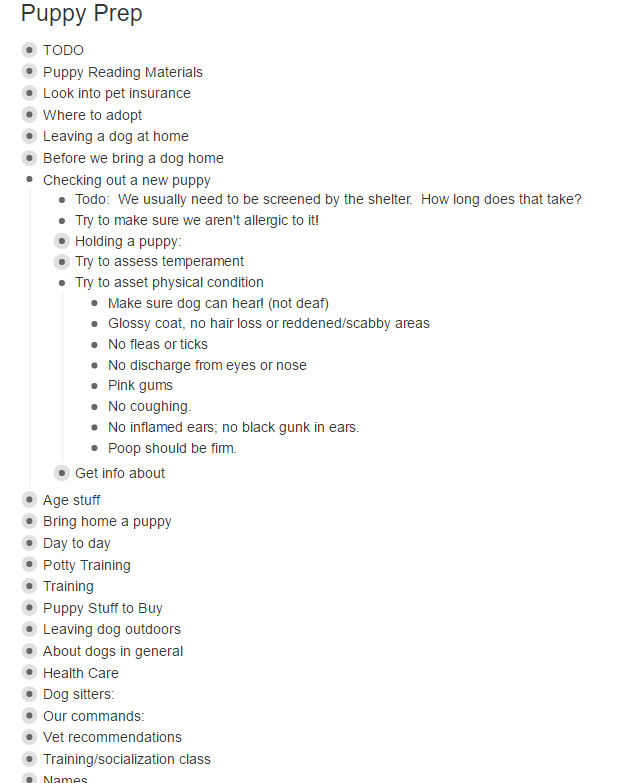 This might be stuff like a place to jot down fun childhood memories that pop up, or a list of info for my cat (vet name/address, microchip registries where I have him listed, etc.). This is a place of records and research – if someone recommends a good book I have a list to jot it in. If I have an idea that might make a good talk someday, but not for an upcoming event, I’ll stick it here. It is #2, the Next Actions section, which is where the bulk of my organizing happens. The “next actions” idea is one of the biggest things I got out of GTD, though I do not follow it strictly as defined in the GTD. The idea is that at the lowest level, you figure out what are the discrete, actionable next steps to advance any project. By focusing on what’s-the-very-next-thing-I-need-to-do and keeping them specific and verb-oriented, it means that if I have a block of usable time, I can skim through the list and for each action judge if I have the appropriate context and needed level of energy to do it. They are like instructions. So say I am in a place where I am dealing with students, and I skim through, see for Student A I need to play their game and give feedback and send them a link for an article that’s relevant to their game. Maybe I don’t have a lot of energy at that point, or not a lot of time before I have to go off to some other thing, so I opt to write him a quick email with the link. Project advanced! As a departure from the GTD recommendations, I also keep some non-actionable lists in this section, but they are always tied to something active. So if I’m about to travel I might sit down and make the list of stuff I need to pack under the next action “prepare for travel”. Or if the next action is “solve this problem in my game” I might list all my ideas and things to try. It’s easier for me to keep those sorts of lists close to where the rest of the context is rather than trying to keep them as reference items. Keeping detailed lists may be fine and well, but if you don’t have a system for updating and processing those lists, they can quickly become out of date and irrelevant. Again, my intent is not to say “this is how you should do it,” but to give you an idea of one approach. I break things down based on time frames. Sometimes I further specify if they are passive methods or active methods. If I am working at a computer on ANYthing, I usually have my workflowy tab open. This is both to reference and figure out what I should be doing next, and also to have it on standby to note things down as I think of them. If I complete a step in my current task I come back to Workflowy to cross it off and perhaps update what the new next action should be. Sometimes I am very actively working in Workflowy making new lists. 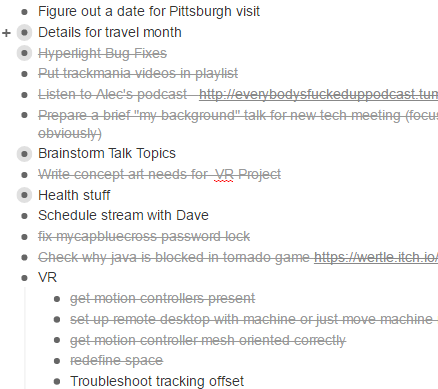 This could be because I’m brainstorming ideas for something, or trying to work out structure for a talk or article, or making a new to-do list for something that is happening very short term (I’m doing a game jam so here’s where I quickly plot what steps need to happen immediately). Every now and then I usually take a moment to scan through all of my open next actions, just to get a mental grasp on what’s going on and to see if there’s anything that’s slipped off my radar that needs to be back on. This is also the time where I go through and delete anything that’s been marked as “complete.” Some folks like their completed list items to be hidden right away to keep things clean, but I leave them there in their visible but struck-through state. This is because going through and deleting all crossed off items in one go FEELS good. It’s like a tangible reflection of productivity and I find it incredibly rewarding. I’m also a game designer so go figure. Here’s an example of a section of my current list that is waiting to be cleared out. So much work accomplished! This is also when I move things around if they’ve gotten too unwieldy as far as subcategories. The only reason this whole system works for me is because I give myself permission to be fluid and sloppy, and as a result sometimes things lose consistency in how I nest them or what I subcategorize them as. You might notice in the screenshot above that I had a VR task outside of my VR subcategory, because at the time I did the one task I hadn’t yet needed VR as an entire category. As long as I tighten everything up periodically, this lax approach hasn’t caused me any problems. I try to at least once a year scan through the long term and reference sections and just glance at them. This is a very short process but it gives me a feel for if my goals have shifted or if things that I once felt were important are no longer feeling that way. I don’t do much with the lists at this point but if I realize a new goal has coalesced I’ll jot it down. Every year I will take a weekend and do some major Spring Cleaning in my Workflowy. This is mostly either pruning or tightening up how things are organized on a bigger scale than what I do every few weeks. For pruning, I go through all three sections and take a hard look at anything that hasn’t been touched for awhile or no longer feels relevant. Gift ideas for people who are no longer in my life are removed. Long term goals that no longer apply get deleted.This is also the place where I have a heart-to-heart with projects that I haven’t touched in a year, and decide either to leave them for the future or accept that I’m not going to continue working on them and delete them. Sometimes this is letting go of something that used to be a big active project. Other times it’s just cleaning up little bits of data in References (last night, for example, I tweeted some game feature ideas “free to a good home,” because they’d been in my Reference list for literally years and I knew I would likely never get to do them. Then I archived them and took them out of the system). This might also be a time where I move things in the reference section up to become active projects. And yes! It is! Because all these little odds and ends and processes are things that have evolved with me as I get ever-better at figuring out how I work and plan. I would never expect anyone to follow this structure wholesale, but perhaps it has given people some ideas? To show variation, here are some examples of how other people use Workflowy. Tobias Wehrum (@tolicious) primarily uses Workflowy for 1-2 person projects, preferring Todoist for personal stuff and Trello or Jira for longer term projects with bigger teams. Here is an abstracted version of his structure. Usually he keeps most of these lists collapsed, and “zooms in” on them when dealing with subtasks (to see what I mean by this, just collapse one of the lists and then click on the circle of its bullet point). He tends to keep the “Later” nodes closed and only deals with a few current tasks at a time (the tasks needed to accomplish the current milestone). Unlike my process, Tobias rarely deletes obsolete items, because he seldom adds to the Later category and only infrequently has to check it. In this example, the project is well outside of the prototyping stage, and as such tasks rarely become obsolete. For smaller projects like game jams, some pruning might happen. Nina Fricker has been using Workflowy for years. Besides some more common uses (goals, work tasks, saving links to articles she comes across, etc), she and her husband use it any time they want to do collaborative research together. For example, they use it to do all of their trip planning. If other people want to share examples of their structures and methods, or other articles on personal use of workflowy, I can always add them here. So maybe you think Workflowy might be a good fit for you and you want to give it a shot. But it’s SO simple and flexible that maybe there’s a bit of option paralysis on how to approach it. A blank page with a single bullet awaiting your input might seem daunting. If all of these examples I gave seem complicated, always remember that the systems are evolutions. You don’t have to design your system for how to use your lists before you use them. Tobias mentioned that he started using Workflowy very simply – a single project, to-do items only. Maybe you could start with just one idea that you need to brainstorm, and list your ideas. If you’re writing things down and realize you could group some of them together, you can just move them around. Start simply, and if it clicks with you and you keep using it, you’ll naturally develop structure and process that works for you. If you’re anything like me, then before you know it you’ll have a years-evolved productivity machine that has grafted itself firmly into every facet of your life. That’s an amazing article, thanks! Ive been looking for Trello alternatives as thats just not how my brain works. I think in the free one you can do dropbox backups and there are themes and stuff but I haven’t investigated too much, haha. The one thing is there is a space limit on the free version, but I used it for ages and never hit it.